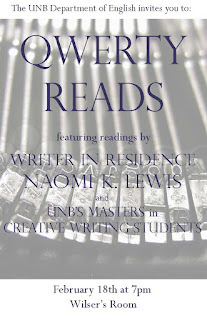 Qwerty Reads takes place tonight, February 18 at Wilser's Room (366 Queen St.) featuring readings by 1st-year MA in Creative Writing students, a reading by Naomi K. Lewis, UNB's writer-in-residence this semester, and live music by UNB students. The festivities start at 7pm. 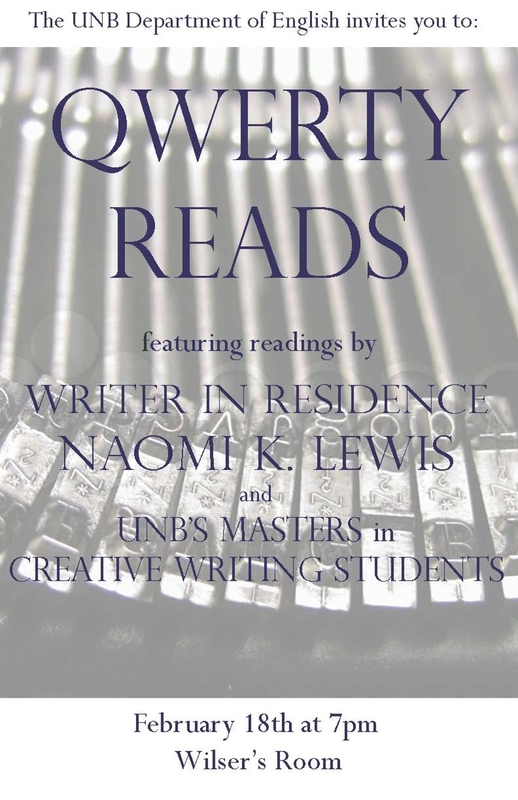 Qwerty Reads is a monthly reading series hosted by Qwerty Magazine and aims to promote the magazine and the local arts scene in general. 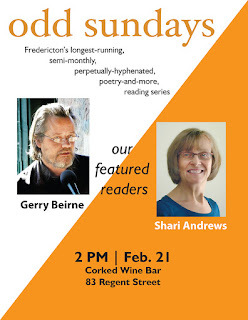 Each event features a different headline reader - sometimes it's a writer coming through town promoting a new book, sometimes it's a member of the UNB community. "odd sundays" continues on Feb. 21. 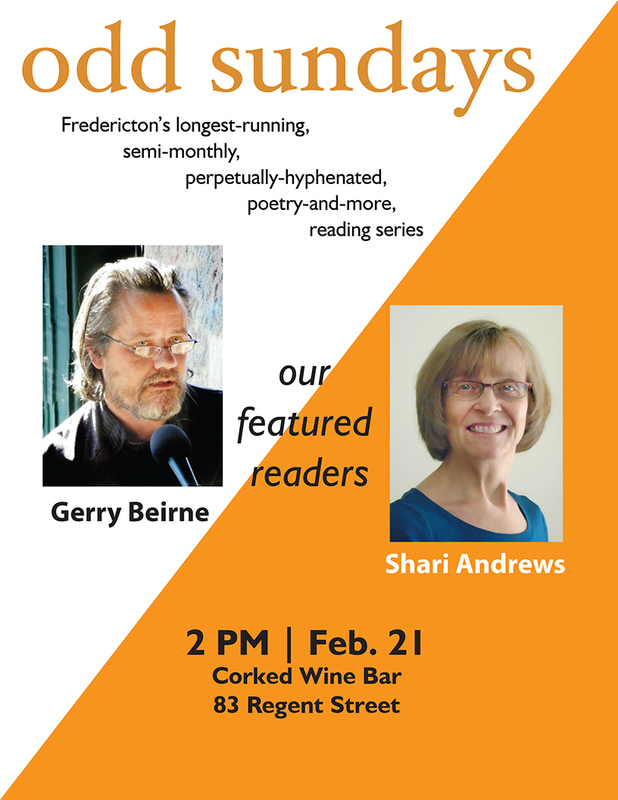 The featured readers will be local writers Gerry Beirne and Shari Andrews. Gerard Beirne is an Irish writer. His collection of short stories, In A Time Of Drought And Hunger, has just been released by Oberon Press. He is a past recipient of The Sunday Tribune/Hennessy New Irish Writer of the Year Award. His novel The Eskimo in the Net (Marion Boyars Publishers, London) was short-listed for The Kerry Group Irish Fiction Award 2004. Shari Andrews’ recently launched her sixth collection of poetry First Thin Light. 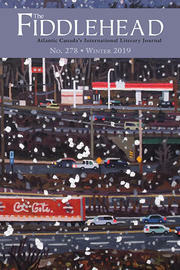 In this her fifth book from Oberon Press, Shari "considers the bonds that tie the present to the past in terms of what it means to be female, and the influences both obvious and subtle that have gathered to define her." As always the opening part of the afternoon with our featured readers will be followed by a short break. Then comes the open mic session and our now-becoming-famous book draw to close out the afternoon. The event takes place at Corked Wine Bar, 83 Regent St., which opens at 1:30. The festivities begin at 2:00. 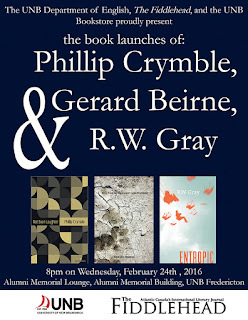 The UNB Department of English, The Fiddlehead, and the UNB Bookstore are pleased to invite you to the book launches of Phillip Crymble, Gerard Beirne, and R.W. Gray. 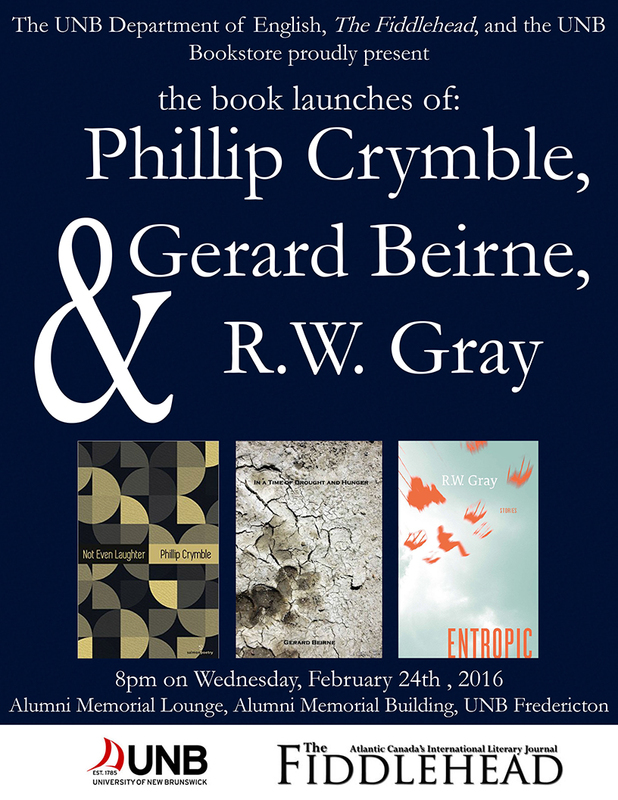 The event will take place at 8 pm on Wednesday, February 24th, 2016, at the Alumni Lounge, in the Alumni Memorial Building, on the UNB Fredericton campus. Phillip Crymble's first full-length collection, Not Even Laughter, explores the work and sensibilities of those whose ideas and visions have been long overlooked. The technical acumen, ear for music, and emotional sincerity unite the eclectic subject matter in this literary debut. In his second collection of stories, Entropic, Canadian author and filmmaker R.W. Gray once again finds the place where the beautiful, the strange, and the surreal all meet--sometimes meshing harmoniously, sometimes colliding with terrible violence, launching his characters into a redefined reality.